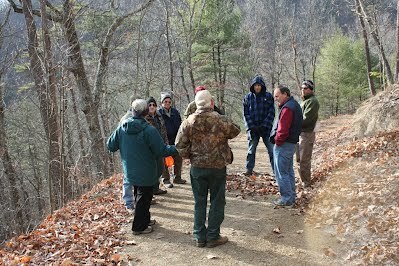 Forest stakeholders met to see if they could find common ground. In September 2010, a diverse group of George Washington National Forest stakeholders began to collaborate to see if they could find common ground and come up with a joint set of recommendations for the new GWNF Plan then under development. Friends of Shenandoah Mountain participated in a series of stakeholder meetings, along with representatives from timber, game management, wildlife conservation, mountain biking, wilderness, off road vehicle clubs, and environmental groups. The stakeholders found a great deal of common ground, but there were also differences. In order for the collaborative process to succeed, compromise was necessary on all sides. After a year and a half of discussion, field trips, and negotiation, most of the participants in this diverse group came to agreement on a set of recommendations, called the Consensus Agreement (CA), to present to the GWNF Planning Team. Friends of Shenandoah Mountain signed the CA because we believe broad-based support from diverse interests will be necessary to achieve our goal of protecting our wild heritage on Shenandoah Mountain. During the process of negotiation, we agreed to several boundary adjustments to our Shenandoah Mountain National Scenic Area and Wilderness proposal. We are pleased that all of the roadless areas on Shenandoah Mountain between Rt. 33 and Rt. 250 remain in the proposal, as well as the Hone Quarry area and the North River Gorge area. The areas that were removed from our proposal, such as the Dowells Draft area and Narrowback Mountain, have historically been managed to create early successional habitat for species such as turkey, grouse, and deer. FOSM found it reasonable to compromise by removing areas on the periphery of our proposal that have been historically managed while retaining core wild areas that are the heart of the proposal. (See map showing SMNSA boundary adjustments.) We also agreed to support an increase in wildlife management through timber harvest and prescribed burning across the GWNF. Field trips helped stakeholders find areas of agreement. Unfortunately, we were not able to get agreement from the stakeholders group to protect Laurel Fork and Kelley Mountain-Big Levels, two outlying areas that have been part of the Shenandoah Mountain Proposal. Although it was difficult to compromise on these areas, the Shenandoah Mountain area is our highest priority for protection. Shenandoah Mountain also faces the greatest threat, industrial energy development. The CA recommends a continuous collaborative process that engages forest stakeholders at the project level. Timber and game management, trail development, and permanent protections will be planned and move forward together. This process will ensure that the goals of the diverse groups are met. FOSM plans to participate in this continuous project-level collaborative process. We will continue to advocate for Laurel Fork and Kelley Mountain within the stakeholder process. The comments on the GWNF plan that the Stakeholders group submitted on October 17, 2011, and that Friends of Shenandoah Mountain signed onto are attached. The new George Washington National Forest management plan, released on Nov. 18, 2014, recommends the Shenandoah Mountain National Scenic Area for Congressional designation! This recommendation is a big step forward, but we must still work toward federal legislation. In addition to working toward protection of this large core natural area, Friends of Shenandoah Mountain continues to support increased management activities elsewhere in the national forest, through timber cutting and prescribed burning, to create young forest habitat for the benefit of many species such as turkey, grouse, deer, and many songbirds.